The scope of what will be written will hopefully help those blessed with a pipe organ in their care to make more informed decisions about how to have it cared for long term. We offer here a list of five things that will answer the most common questions we receive on this very topic. 1.) Form a positive relationship with a good organ building firm: This seems like a logical first step, but is also critical for establishing a stable and efficacious plan for keeping the instrument in good working order. A good firm, staffed with personable and knowledgeable builders, can adapt to the needs of each of the instruments in their care to deliver diligent service and provide insight and guidance. Of course, it is wise for a venue to be very careful about who they entrust with this responsibility. There are many skillful craftsmen in the organ-building trade. It is certainly not unreasonable, considering the magnitude of investment represented in any pipe organ, to interview a prospective firm prior to making any commitment, to ask for references, verify insurance, and even to view other work that firm has performed, especially if it is likely they will be called upon to perform major work in the future. The level of competence of a prospective builder should be considered above all other considerations, as poor decisions can mar a fine instrument permanently, or cause other problems that will negate any perceived monetary savings by substandard work. The mechanics of organ building are simple to learn; the philosophy required for good execution of the craft takes years to develop. Also, selecting a firm that is easy to communicate with, and who keeps a professional regard to punctuality, will save substantial headache. They should feel that their organ builder has “got their back” when they need them. Aside from being a competent craftsman, a good service professional knows that “without clients there is no craft,” and will strive to prevent abuse by way of being unreasonably tardy in appearing to appointments or delivering work. We are always astounded, when meeting new clients, at how much of this abuse a venue will tolerate before considering alternatives. It may be that a suitable builder will need to be brought in from another city. Though the perceived expense of travel may seem prohibitive, often that builder will already have several other clients in the area which will make this much more reasonable. 2.) Work with your organ builder to set up a plan: Once sufficient consideration has been given and a firm is selected to be the organ’s custodian, an appointment is usually made to assess the organ. We often include this in our first tuning, and all known or potential issues are recorded. Regardless of the financial status of the client in question, the client should know of any problems with their instrument, and their builder should work with them to help them understand the level of importance and financial commitment required for each item, even if they will not be remedied right away. Beyond this, builder and client should discuss frequency of tuning and service visits. Our firm resists the temptation to fit each client into a box, instead discerning the client’s needs and forming a plan that best fits their needs and that of their instrument. As service visits come and go, the builder should keep a lookout for potential issues and record them for the client. Our Service Analysis explains what was accomplished during each visit, details what issues were not addressed, and re-iterates any outstanding issues so the client understands they have not been remedied. 3.) Keep good records: It is always a joy when clients pull out a complete dossier of records on their instrument, especially if the instrument is historic. In the best situation, this information can be used to make informed decisions concerning tuning, or for restorative work. On the other hand, we have experienced instruments where detrimental revisions were made, and lack of records prevented a clear picture for returning the instrument to proper order. Also, modern technology makes it very easy to record very accurate pitch and temperature data, and since these two factors are critically important to maintaining stable tuning, we record them on each Service Analysis, and reference these documents during each subsequent tuning. That way, we can be assured that the tuning is being done correctly each time. 4.) 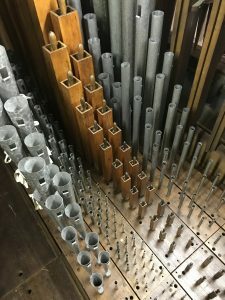 Be conscious about environmental considerations: The pipe organ is a “living, breathing” entity, and responds to the environmental changes it is subjected to. 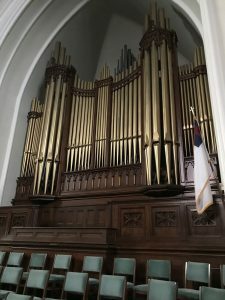 Making deliberate decisions on temperature control in the building will help stabilize tuning and can add years to the life of the delicate woodwork and leather in a pipe organ. See our guide Temperature and the Pipe Organ for more detailed information on this topic. 5.) 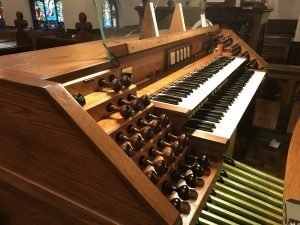 Get your congregation excited about the organ: When we explain our vocation as pipe organ builders to people “on the street”, we are nearly always met with fascination and excitement. 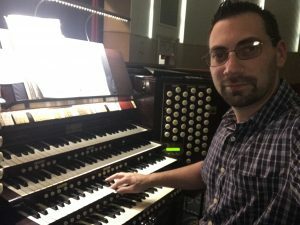 In a world brimming with technology, the reality of the pipe organ as something more than just a pretty display of gold pipes is something many have overlooked completely. Many churches have inherited these treasures, a direct result of the stewardship of their forbears, and the artistry of some of the most highly-trained craftsmen in the world. We can easily ensure that these instruments will continue to be passed down by making people in the pew aware of the beauty and craftsmanship of the instrument, and by involving them in understanding what is required to keep them in top shape. We love to work with a congregation that is proud of its pipe organ, no matter how big or small, especially since they are usually happy to see us keeping it in top shape! St. Marks Episcopal, Louisville, KY; Console reconfigured for drawknobs 2017 by D. C. Schroth Organ Builders.